I was in San Francisco – one of my favorite cities – this week and went to a Filipino restaurant out there. 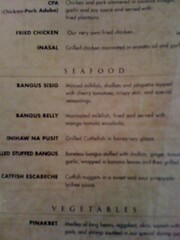 I had no idea what to expect from the food – I was guessing pork-based or heavy on the seafood with Spanish influences. But beyond that I wasn’t sure. If you can read the menu you can see that it is pork and fish based with Spanish influences. But they’ve also got some stuff that I’ve never seen on a menu before. 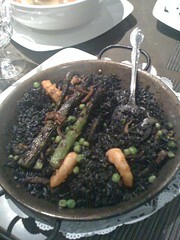 Like paella with squid ink rice and squid flakes. 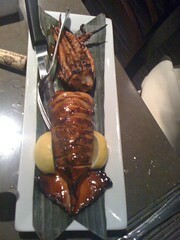 And grilled cuttlefish stuffed with a fresh salsa-like concoction. Everything was excellent. My favorite was the cuttlefish. It was less chewy than squid typically is with a little more flavor. You could taste the grilledness in it and the salsa fresca was excellent. The squid ink gave the paella a slight sea taste, though not quite fishy.The squid flakes were dried tentacles and were slightly crunchy. Beau Woods is a cyber safety innovation fellow with the Atlantic Council, a leader with the I Am The Cavalry grassroots initiative, and founder/CEO of Stratigos Security. His focus is the intersection of cybersecurity and the human condition, primarily around cyber safety, ensuring connected technology that can impact life and safety is worthy of our trust. Over the past several years in this capacity, he has consulted with automakers, medical device manufacturers, healthcare providers, cybersecurity researchers, US federal agencies and legislative staff, and the White House. Posted on August 29, 2009, in USA and tagged california, cuisine, cuttlefish, filipino, food, paella, san francisco, squid, squid ink. Bookmark the permalink. Leave a comment.